Foreign Minister Javad Zarif and Major Gen. Qassem Soleimani have little in common — except their popularity in Iran. Senator Tom Cotton, the author of the controversial Republican letter to Iran, recently said: “[T]here are nothing but hardliners in Iran, nothing but hardline Islamic extremists who’ve been killing Americans around the world.” This idea of the Islamic Republic being led by “mad mullahs” has remained a constant part of the discussions on Iran since the advent of the regime in 1979. Yet, nearly four decades after the rise of the Ayatollahs, the two most visible faces of the country in the world are in fact not mullahs and couldn’t be any more different. Foreign Minister Javad Zarif is Iran’s chief nuclear negotiator, responsible for leading the nuclear talks between his country and the world powers in Switzerland. 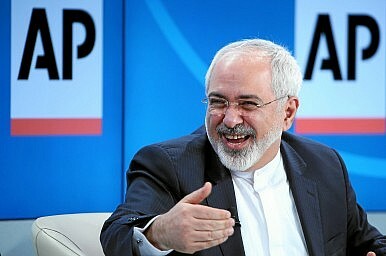 Zarif, nicknamed the “smiling minister” in Iran, is known for his tact and cheerfulness. He is extremely popular at home and the face abroad of Iran’s moderate government led by President Hassan Rouhani. Older Iranians who keep tabs on who is “old money” and who has made their wealth after the revolution (generally seen as a sign of corruption) would describe Zarif’s family as “reputable.” Zarif himself left Iran to study in the United States, where he received his PhD at an early age. Like the rest of the Rouhani cabinet, which has the highest number of individuals holding advanced degrees from U.S. institutions of any foreign government, many in Zarif’s circle of advisors are also Western- and specifically U.S.-educated. Zarif’s background and education stand in stark contrast with the other most photographed face in Iran. Major General Qassem Soleimani is the commander of the Islamic Revolutionary Guard Corps’ elite Quds Force. This is the branch of the paramilitary forces responsible for Tehran’s covert operations beyond its borders. A rather obscure figure in the West until a few months ago, Soleimani has led his country’s battle against the Islamic State (IS, also called ISIS) in Iraq. His presence has been documented and used as a platform to showcase Iranian control of the situation and influence in Iraq. Soleimani comes from an underprivileged family and never went beyond high school. He joined the Guards when they were established as an alternative to the traditional military at the beginning of the revolution. Zarif and Soleimani’s paths have little in common. Their approaches to foreign policy and securing national interests are equally different. But they seem to share the top two spots for Iran’s most popular figures. Zarif’s popularity is easy to understand. He represents moderation and engagement with the world, something many Iranians are longing for after years of political and economic isolation. Soleimani, on the other hand, has become popular despite the Guards’ general bad reputation and unpopularity among Iranians. After all, the Guards are seen as the perpetrators of human rights violations in the country and their name is associated with crackdowns on those with divergent views. But Soleimani and his team stepped in and capitalized on a bigger fear in Iran: the threat of a foreign attack. Over the summer, when IS was quickly making progress in Syria and Iraq, the world was dumbfounded. In Iran, IS was a bitter and scary reminder of an eight year war with Iraq in the 1980s, which led to hundreds of thousands of casualties. In cabs, shops, and elsewhere, concerned Iranians discussed the prospect of IS successfully threatening their country’s western border. That’s when Soleimani and his team started their media campaign. They stepped in where the international coalition’s efforts weren’t enough. They helped push back IS in key areas, including most recently Tikrit, doing so with a lot of noise and “bling.” The bling served to show the West that Iran could succeed where it couldn’t. It was a signal to IS that it shouldn’t mess with Iran. And it reassured Iranians that the Guards, their Guards, were here to protect the borders. Zarif and Soleimani have little in common. Their background, families, education, the files they handle, and their approaches are different. The cameras capture one’s handshakes with the West’s foreign ministers in Vienna, Geneva, and Lausanne, and the other talking with fighters in the dusty battlefields of Iraq. But considered together, these two men symbolize Iranian foreign policy more than three decades after the revolution. They show the complexity of Iranian politics, something that the caricature of the “mad mullahs” fails to fully appreciate. They show Tehran’s priorities and strategy beyond the revolutionary rhetoric. They are a sign of the flexibility and wide range of tools Iran has at its disposal. Ariane M. Tabatabai (@ArianeTabatabai) is a visiting assistant professor in the Security Studies Program at the Georgetown University Edmund A. Walsh School of Foreign Service and an associate at Harvard Kennedy School’s Belfer Center for Science and International Affairs.